Snake away works by causing the sensory organs in the snakes mouth (tongue, etc.) to become off balance. This causes the snake to not be able to sense its food source, which is usually mice, field rats, etc. 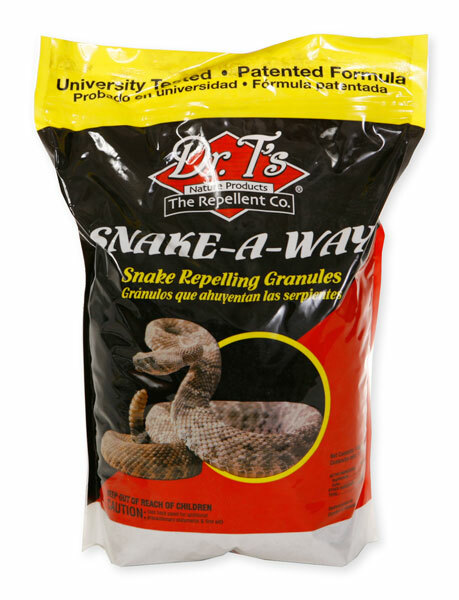 If you place the Snake Away around the perimeter of the home, it usually works to keep the snakes away. The only downside, is that it can be a little smelly, and it needs to be reapplied every couple of weeks for best results. The reason you have snakes is because they are looking for mice and rats. If you get rid of the mice and rats, it will help to get rid of the snakes. Keeping them out can be difficult and is the reason why that constant diligence and an ongoing program is essential to a success.